Castor Oil has been used throughout the ages as a natural therapy. Castor Oil applied externally in the form of “packs” is a very popular method among health care practitioners. The packs have been used to improve assimilations, eliminations and circulation; especially of the lymphatic system. A Castor Oil Pack is made from several layers of flannel-like material, enough to absorb and hold the Castor Oil during application. The flannel material is available as wool, cotton or the convenient disposable pack. Whichever you choose, you will need to saturate the material with Cold Pressed Castor Oil, or Palma Christos® Organic Castor Oil before applying. A common area to apply the Castor Oil Pack is the right side of the abdomen, between the lower part of the rib cage and the upper edge of the hipbone. Another common area is across the abdomen, covering from the sternum to the pubic or groin area. Many have also found the pack to be effective when applied to joints and on the back as well. Application should last for 1-2 hours for 3-4 days in a row, however, it is best to consult your health care practitioner to determine frequency and duration of application. A heating pad is placed on top of the Castor Oil pack to keep it very warm during application. You can use the same Castor Oil Pack repeatedly depending on which flannel you choose. 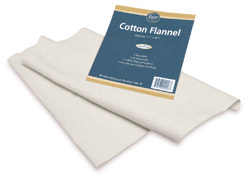 The wool and cotton flannel packs may be used for approximately 25-30 applications before they are to be discarded. The disposable packs may be used for about 8-10 uses before discarding. It is important to discard the pack after a certain number of uses before it becomes rancid. It is helpful to store the pack in a plastic storage container and refrigerate between uses. Before you begin, you will need to choose either the Wool Flannel (#757), Cotton Flannel (#759) or one of the Disposable Flannel ( #755 or #799) Packs (the Disposable Flannel Pack consists of flannel-like material which is absorbent on one side and is lined with plastic on the other side to protect your heating pad). Selecting the proper material is a personal choice. Some individuals are sensitive to wool or cotton. If your choice is to use the Cotton Flannel (#759) or Wool Flannel (#757) Pack, consider purchasing several Disposable Flannel Packs for bed or sheet cover protection. The plastic side of the Disposable Flannel Pack will prevent Castor Oil from soiling your linens or sheets. Pour approximately 1 cup of castor oil to wool or cotton flannel. Then add several ounces to refresh with each use. Apply ½ cup to the disposable pack. Then add several ounces to refresh with each use. Palma Christi Castor Oil or Palma Christos® Organic Castor Oil are available in many sizes. Most individuals start with a quart. Small amounts of Castor Oil should be added to your pack before each use. Heating pads are also available. Baar Products Castor Oil, also known as Palma Christi or the “Palm of Christ,” is cold pressed and cold processed Castor Oil without hexane. Palma Christos® is an Organic Castor Oil that is cold pressed, cold processed, hexane free. Place a Disposable Pack (#755 or #799) with the colored plastic side down on your bed for protection against the Castor Oil soiling the sheets. Place the heating pad on top of this protective pack and turn it on to a medium or high setting. If the pack that you are using for application is a Wool Flannel or Cotton Flannel material, then protect your heating pad by placing plastic wrap on top of the heating pad or a small Disposable Pack (#799). Next, fold the wool or cotton flannel into 3 layers and place it on top of the plastic wrap. • If using the Disposable Flannel Pack for application, pour the Castor Oil in a circle in the middle of the absorbent white material side. Apply ½ cup of Castor Oil to the disposable pack. When doing this, the plastic side will be against the heating pad in place of the plastic wrap. Plug in and turn on the heating pad. Place the Castor Oil Pack on the heating pad for about 10-15 minutes to warm the pack. This also gives the heating pad time to reach its peak temperature. When you are ready to begin, flip the Castor Oil Pack and heating pad onto your abdominal area and relax. General application time is between 1-2 hours. After your session, clean the oil from your body with CastorWash #769. Many people store the Castor Oil Pack in a plastic storage container between uses. Be sure to keep the pack out of the sun and in a cool dark place, preferably the refrigerator. After 3 days of using the Castor Oil Pack take about ½ - 1 teaspoon of olive oil (NOT Castor Oil) by mouth. Taken usually in the evening before retiring. For medical conditions always seek medical advice. Do NOT use during pregnancy or during menstrual flow. We've had many questions regarding how to use our Castor Oil Disposable Packs. We've put together this short video to further demonstrate their use. The video does not contain audio. * Free shipping offer valid only for internet orders carrying a subtotal of $99.95 or more shipping to the Continental US via Ground service. Must ship to street addresses. Offer not valid on call-in or wholesale program orders, or orders with a weight of more than 50 lbs.